We encourage an integrated approach for goose removal in Charlottesville and other areas of Virginia. Canada geese damage management, removal and control that considers the suitability of all the available tools. The successful management of Canada geese will only be accomplished by utilizing a wide variety of techniques for goose removal. CAUTION: Potential customers considering hiring ANYONE for Canada geese management, goose removal and control techniques in Virginia should contact us to avoid violating Federal, State and local laws, regulations, or ordinances, that govern Canada geese and their remediation. The goose removal process can be complicated, but we can help. Contact us today. Ban Feeding. Geese tend to stay where there is food present and where there is a source of open water. This can complicate goose removal in Richmond, Charlottesville and throughout Virginia. 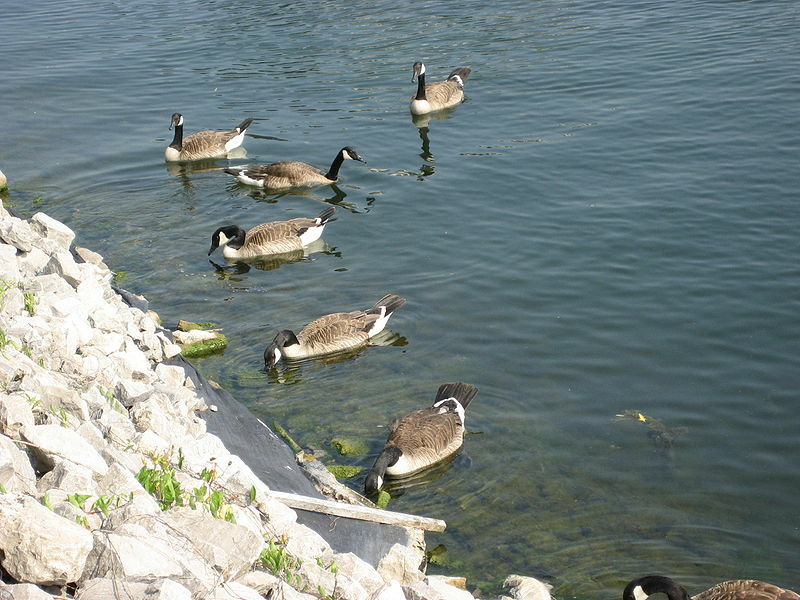 Some people like to provide resident geese food throughout the seasons, which can cause problems because the geese will associate the site with readily available food. It becomes difficult to remove the geese from such sites. Education and regulations can help decrease food handouts. Educational signs explaining why it is important not to feed the geese and fencing around their routes to prevent feeding can help decrease public feeding. Grass Cultivars. Less nutritious grass can be obtained by mowing and fertilizing as little as possible, planting a less-palatable grass species (geese have a high feeding preference for Kentucky bluegrass, they dislike tall fescue, especially varieties that contain endophytic fungus), replacing lawns with unpalatable ground cover such as: common periwinkle, Japanese pachysandra, and English Ivy. Disrupt Travel and Sight Lines. Plant bushes, hedges, or shrubs to make the area appear unsafe to the geese. Canada geese tend to avoid areas where predators are able to hide. Increase the slope of banks to 64 degrees or steeper for a length of at least 2 meters. Radtke and Dieter found that geese would not use a pathway with a slope of 64 degrees for more than 2 meters. Geese did, however, use a pathway with a 54 degree slope for 1.5 meters. 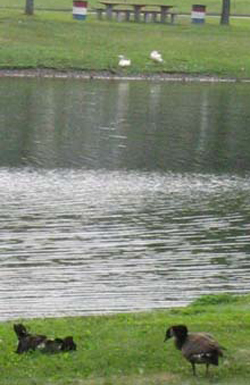 Geese are less likely to walk to food that is placed beyond 39 yards from the water line. Pros. Exclusion method is one of the most effective non-lethal techniques when used properly. Cons. Fencing and overhead wires can restrict access to people as well as geese and these techniques also might not be visually pleasing. Ultimately those who desire to manage Canada geese have to decide whether the benefits outweigh the negatives. Fencing. Fencing is one of the most effective non-lethal techniques when used properly. Canada geese prefer to feed, roost, and loaf near water where they can escape if threatened (Gosser et al. 1997). Restricting access to water from land will help deter geese away from that area, and fencing completely around a pond can be very effective, especially if the geese are molting. Short fences, vertical banks, or hedges at least one foot high around ponds can be adequate especially if the geese have goslings. Even if the geese are able to fly the barrier between the pond and lawn, the hassle of continuously flying over the fence will eventually drive the geese away. 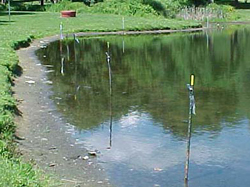 On smaller ponds you can strand high tensile wire or UV-resistant polypropylene line across the pond. The lines should be no more than five feet apart and at least 3-4 inches above water level. Strands should be held in tightly to prevent sagging and should be tied around individual stakes to make repairs easy. Electric fences have sometimes been used on private land. The energizer delivers an uncomfortable shock that geese will quickly avoid (Gosser et al. 1997). Check with local authorities before using this technique. Pros. Frightening techniques are most effective when the geese first arrive at a site or at night when they are roosting. Some common devices include pyrotechnics, flagging, balloons, scarecrows, and recorded distress calls (Gosser et al. 1997). Use of more than one technique to improve efficacy. Cons. These techniques tend to only work in the short term and/or must be used repeatedly. Strips (2 to 3 feet) of 1-inch wide Mylar® tape are attached to poles so that they can swing and flutter in the wind. Tethered scare-eye balloons or similar products may also be used. Think of pyrotechnics as specialized fireworks that are fired from a special starter-pistol or single-fire shot gun. Pyrotechnics are highly effective at moving geese. However, pyrotechnics present several safety concerns. Users must wear eye and ear protection and only discharge pyrotechnics in areas where neighbors will not be disturbed and local ordinances allow. Pyrotechnics also pose potential fire risks. Permits may be required to purchase some versions of pyrotechnics. Always consider where the frightened geese will go as their flight may pose hazards to vehicles and aircraft. Pyrotechnics should not be used during the molt. Sillouettes of coyotes (made of plywood or poster board) or actual stuffed coyotes have been effective in scaring geese away from locations. Moving the effigies regularly or purchasing those that can move or spin increases their frightening ability. A floating alligator head is also available. Do not begin the use of effigies during the molt. Lasers. Green and red lasers have been found to be effective in frightening geese. Best used in low-light conditions or at night. To prevent risk of injury, keep the beam horizontal to the ground. Consider the back ground before shining. Never shine in human eyes and NEVER shine in the sky. Do not use for goose removal during the molt. Mechanical hazing (boats, planes, helicopters) . Like other hazing techniques, mechanical hazing is time intensive. Boats are the easiest to use but must be used on ponds and lakes small enough to allow the boat to remain in range of the controller. Ponds with lots of subsurface and surface obstacles make boat use difficult. Capsizing of boats is common. Mechanical hazing devices should not be used during the molt. Dogs. Dog such as Border collies may be used to frighten geese. They require training and can be quite expensive to own as the dog must be maintained throughout the year even when geese are not being hazed. Dogs should not be used during the molt. Swans. 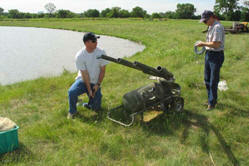 They have not been shown to be effective in keeping Canada geese away. They are also more aggressive than Canada geese increasing the potential for human injury. Swans also change the habitat of the pond. Their longer necks allow them to pull vegetation that is deeepr in the water thereby modifying the underwater plant mix. Methyl Anthranilate. (Pesticide permit required) Methyl-anthranilate is an extract from grapes (which is used to flavor grape drinks for human consumption) causes a pain sensation to the geese when they inhale it. Spraying the desired area or using a fogger is an easy way to apply this repellent. Anthraquinone. (Pesticide permit required) Anthraquinone, when ingested by geese, causes stomach upset, which deters geese from eating the grass through a behavioral mechanism known as “conditioned aversion.” This repellent is sparayed on the grass. Anthraquinone also has a sparkle effect (visible to geese but not to humans),which allows the geese to identify treated areas and avoid foraging there. Netting. Geese are pre-baited to habituate them to feed in the capture zone. Net is fired remotely. Geese must be gathered up quickly to prevent injury and to ensure effective goose removal. Round Ups. (Permits required). During June and July, geese are flightless due to molting. Goose removal during this period is done by herding geese into funnel traps and then translocated or euthanized depending on the permits. Translocation is most effective with goslings as they have not become attached to the location. Translocation is also costly in terms of labor and travel. If euthanasia is chosen, use cervical dislocation or asphyxiation with carbon dioxide. Both methods are humane and relatively cost-effective. AAlpha-chlorolose. (Available to USDA-Wildlife Services Only). This chemical is used as a stupefying agent to allow the capture of geese. Translocation. (Permits required). You must separate goslings from adult birds. Only translocate the goslings as adults will return to the initial capture location (Holevinksi et al. 2006, Groepper et al. 2008). Hatch-year birds are likely to stay at the release site if after-hatch year birds are not present (Gosser et al. 1997). Euthanasia methods include carbon-dioxide and neck wriging. Carcass Disposal. Consult your local landfill or health department on proper disposal of geese carcasses. Food Use. Consult your state wildlife agency on proper methods to prepare geese for human consumption. Legal Hunting. Hunting is an effective method for goose removal by reducing populations and deterring geese from an area. Most states with populations of nuisance Canada geese offer special hunting seasons that target local geese during the fall but before or after the migratory goose populations move through (Gosser et al. 1997). Seasons have bag limits and possession limits, that vary from state to state. Shooting of problem geese can be controversial and may be met with opposition that must be addressed in a considerate manner. Public education, including evening meetings with printed material may be needed when implementing this management strategy. An educational process should be built into the timetable for the goose management plan. 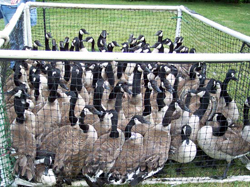 Urban flocks of Canada geese can be difficult to hunt because of the obvious hazards to people and property. This fact in concert with the regulatory guidelines designed to protect migratory waterfowl have limited the application of typical waterfowl seasons. However, harvesting enhances other management options. Shooting increases noise disturbance, reduces protected areas available to the birds for feeding or nesting, enhances the effectiveness of habitat modifications, and reduces the number of adults. Harvesting of adults can be augmented with egg removal or puncturing (see below). Hunting is the most cost-effective method for managing populations of suburban Canada geese. Managed hunts are often the best way to reduce goose numbers in urbanized areas. Many states have opened early seasons, commencing September 1, to remove more resident geese. A more effective, site-specific hunting approach has been achieved via the issuance of special purpose kill permits. These permits allow trained individuals to hunt at a specified, restricted location, such as an airport or community wetland. Cooperation with local law enforcement is necessary. These permits have also been issued for some golf courses and parks. To ensure public safety, these areas are closed for several hours on a set schedule for several weeks. Shotguns are typically used for hunting. 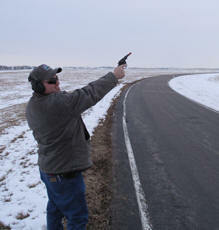 Shotguns propel a small mass of pellets over short distances, impacting the target area at ranges up to 60 yards. Shotguns have a maximum potential to hit the target with the minimum potential of impacting a non-target animal or human. Several states use harvested geese in community food banks, homeless shelters, and soup kitchens. Geese used for this purpose may be either netted or hunted. This is a very positive approach that should be investigated when a local harvesting/relocation measure is being considered. As of 1999, USDA approval has been required for the donation of goose meat to food banks, so it is necessary to use USDA-inspected processing plants. Goose meat should be inspected for steel shot. 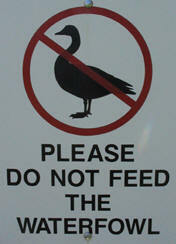 Recipients may need assurances that the geese have not ingested pesticides or other contaminants. 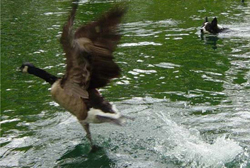 Although contamination is not likely in urban areas, some instances of goose poisoning have occurred, relatve to agricultural chemicals in farm locales (http://www.state.nj.us/dep/watershedmgt/DOCS/BMP_DOCS/Goosedraft.pdf). Sharp Shooting. (Permits needed). Useful for removing isolated individuals. Addling is best done by completely coating the egg with corn oil, which limits the oxygen to the developing egg causing it to stop growing. While other oils can work, federal law only permits the use of corn oil. 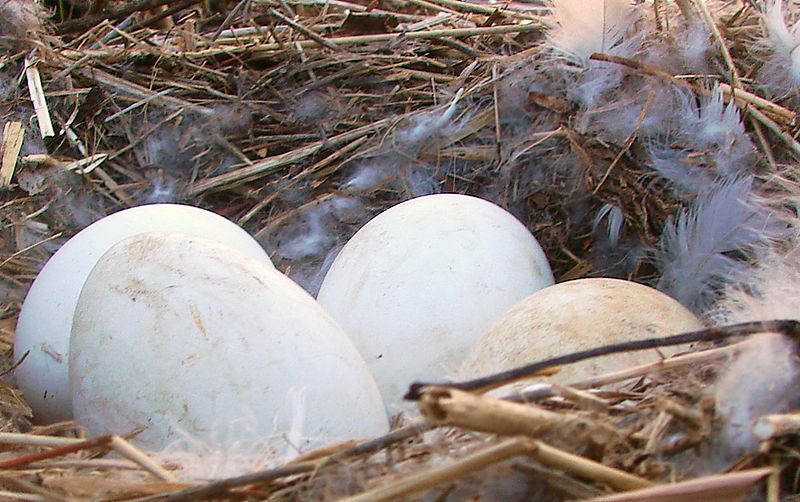 Alternative methods such as shaking or puncturing are either difficult to do or result in speeding the rotting process which increases the likelihood of nest abandonment and the attraction of predators. This product contains the active ingredient nicarbizan which prevents eggs from becoming fertilized and hatching. 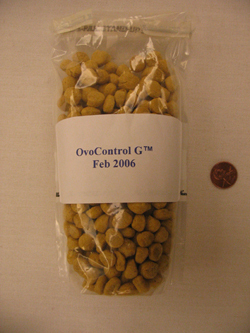 Geese that are fed this product during the egg-laying season will produce sterile eggs. Canada Goose Management Website. University of Nebraska-Lincoln, NRES 348 Wildlife Damage Management class, Spring Semester, 2010. Scott Hygnstrom, Instructor; Stephen Vantassel, Webmaster. Canada geese can be extremely destructive and are known to attack humans while protecting their nests, young or if they feel threatened. The removal, control and management of Canada geese in Charlottesville, Richmond and throughout Virginia should be left to our expert wildlife animal control technicians. Call us at (434) 260-7077 for more information or to schedule an appointment. You can also visit us on the web at Richmond Animal Removal or Wildlife Removal in Virginia. Let our professionals handle goose removal on your property. Call us today at (434) 260-7077 for more information on goose removal and animal removal in Charlottesville and other areas of Central Virginia, or to schedule an appointment.